Mark and I are currently serving in a Spanish branch of our church. Most of the members of our congregation are Mexican immigrants; all meetings and worship services are conducted in Spanish. I teach weekly Sunday School for a group of twelve boisterous eight-to-eleven-year-olds and help organize biweekly activities for them at the church. The other day I was helping my mom clean out some things at her house and she gave me her old tortilla press. I took it home reluctantly. Every time that I’ve tried to make tortillas from scratch I found it to be cumbersome and my tortillas never quite turned out how I wanted them to. I always followed the recipe carefully, but the dough always turned out thick, stiff, and unworkable. Lots of effort with the rolling pin and the tortilla press only gave me sore arm muscles, not perfectly thin tortillas. So I doubted that the tortilla press would get much use, if any. But then I remembered that our activity with the branch kids that week would be tortilla-making: “¡No se olviden de la actividad esta noche! 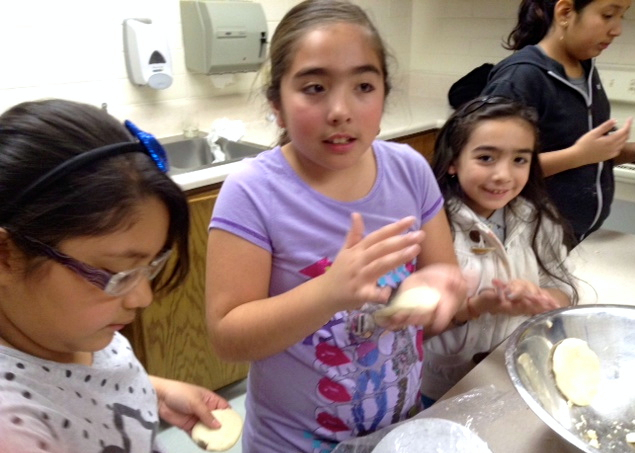 Trae tu máquina de tortillas!” Don’t forget about the activity tonight—and bring your tortilla-maker! Because of course every household possesses a tortilla-maker, right? Well, as of 24 hours earlier, mine did! 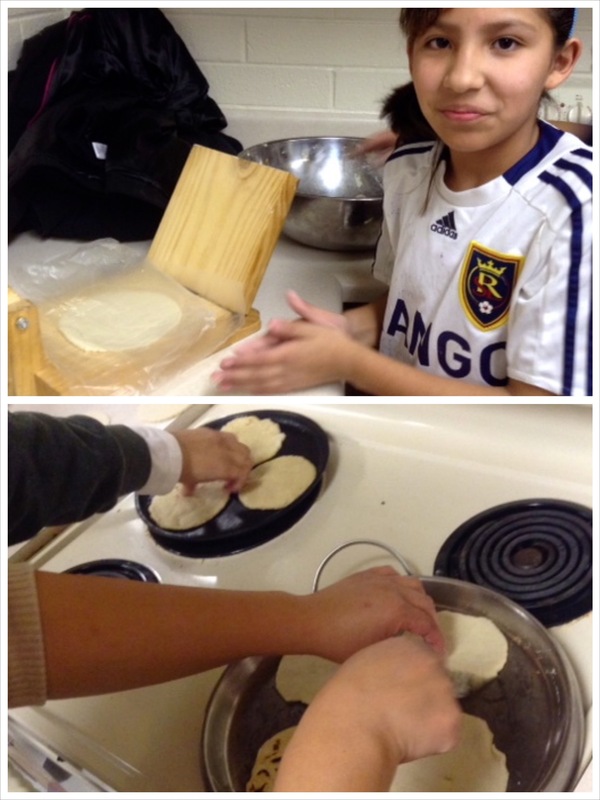 My eight-to-eleven-year-olds combined with the rest of the kids under twelve and we spent the evening making white corn tortillas. The niños took very seriously their work of mixing the masa (dough), forming it into perfectly round discs, and pressing the discs between very fancy plastic sheets (cut-up bread bags and grocery bags) on the tortilla-makers. My new tortilla press in action. Thanks, Mom! 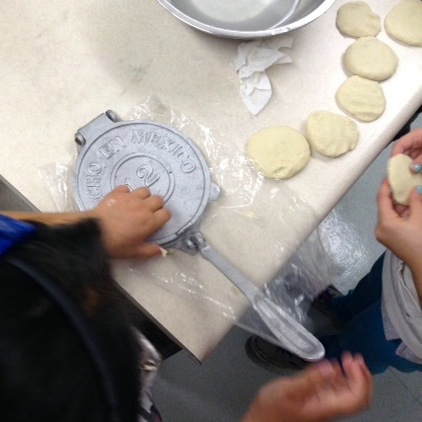 Above, a traditional wooden tortilla press from México; below, Ericka and Noelia fry up the little beauties. 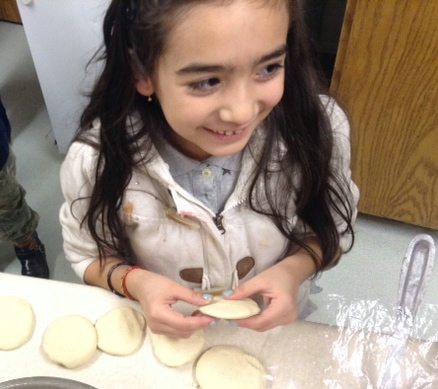 While the kids prepared the masa, my friends and fellow Sunday School teachers Ericka and Noelia fried the tortillas and supervised production. They showed me that the secret to good tortillas is very moist, soft, pliable dough. I learned that the online recipes I had previously used specified an incorrect water-to-flour ratio; the consistency should actually be much softer and moister than bread dough or pizza dough so that pressing the masa into thin tortillas is almost effortless. The night was a success; great fun was had by kids and adults alike. We all devoured inordinate amounts of hot tortillas smothered in butter and queso méxicano, soft Mexican cheese. And if anyone asks, my kitchen does possess a tortilla press. Like every household should. That was actually very interesting. I remember when I went to Mexico when I was in middle school that my family was constantly buying the hot corn tortillas off the street. They were so good! I helped Alice’s mom last summer make homemade flour tortillas, and even though they were definitely good, it was also more work than I would want to do myself.